Having recently become the longest-serving editor in The RAILWAY Magazine’s 117-year history, Nick Pigott has left the title. Nick’s former deputy, Chris Milner, has now stepped up into the role and is relishing the challenge of building on Nick’s record-breaking run. “Nick has steered the title to unprecedented heights in recent years with growth in sales and subscriptions and in the sort of sporting parlance he’d use, he’s leaving with the league title and cup in the trophy cabinet,” said Tim Hartley, publisher of the railway portfolio at Mortons Media Group. The restructure of THE RAILWAY MAGAZINE team sees experienced railways writer and editor Gary Boyd-Hope join the staff on a full-time basis. Nick will remain as a contributor to the title and advisor to the new editorial team. 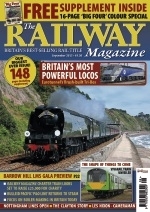 This entry was posted in News and tagged news; new editor; Railway magazine; restructure; Nick Pigott; Chris Milner. Bookmark the permalink.